Sooner or later I will come to the end of my prolific week spent in Venice but for now the photos keep on coming. I’m gratified by the number of half decent pictures I came back with despite walking with crutches due to my disability. Just goes to show that you don’t have to trudge ten miles a day searching for images – If you calm down and wait, they often come to you. Street photography has always been my first love. These two ladies and their dogs passed me by just as I was stepping out of a shop doorway – no time to adjust any settings, and no second chance. The image is not technically perfect, but I think that adds a feeling of movement and spontaneity that I like. Hope you do too. As with all my Venice pictures, I used an Olympus mirrorless camera. This time the OMD EM1 with 12-40mm f2.8 lens. 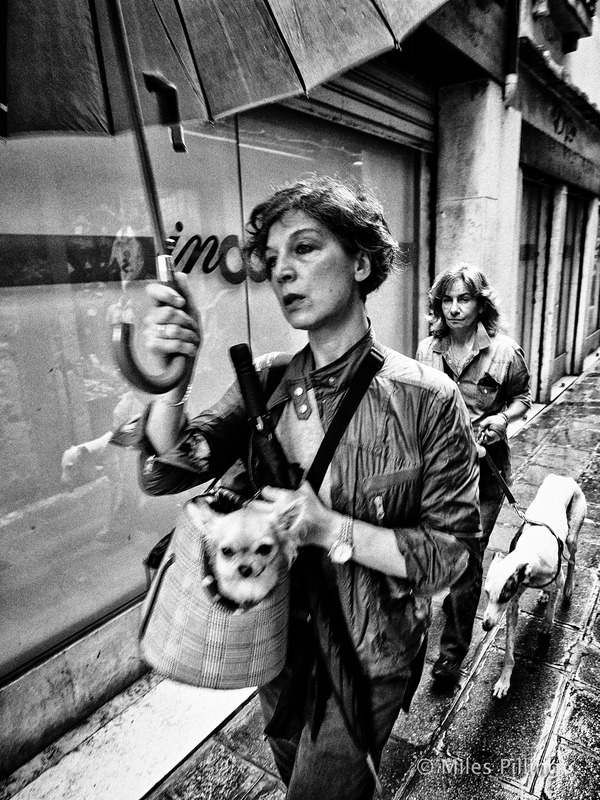 I love using Olympus OMD cameras for travel and street photography. Such a wonderful image of my favorite city. And you do an excellent juggling job as you probably had an umbrella too!